Technically, ice is water, after all it is just frozen water, yet it floats on water. This occurs because when water is frozen, its density changes, hence making it lighter than water. In order to clearly understand this and why it happens, we must first understand density and its applications. Density is basically how much does one unit of the substance weight. Ideally, the formula of density is written as Density = Weight/Volume. This means that something with more density is heavier than something with less density. Hence, something with more density tends to sink in something with less density. Think of a stone in a glass full of water, as the density of the stone is more than of water, it tends to sink in the water. However, if we put something with less density in the glass of water, say ice, it tends to float. Density is constant. It means that it remains the same no matter how much quantity you have. One cube of ice will have the same density as a bucketful of ice. The density of water is 1kg/liter. 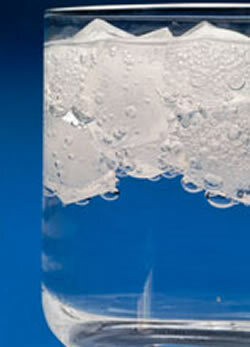 However, when it is frozen, its density is approximately 9% less, technically the density of ice is 0.9340 kg/liter. As it is less than water, ice floats. The reason that the density of water changed when it is frozen, has to do with its chemical bonding. One molecule of water is made up of 1 oxygen atom and 2 hydrogen atoms. When a lot of molecules get together, we get water. When water is cooled down, the distance between the atoms increases, hence increases its volume. In layman’s term, when water freezes it expands. It weight remains the same, but volume increase, thus reducing its density. Again, less density = floating.